It’s about this time of year that our plans for the summer are beginning to take shape; holidays are booked, the odd family get-together arranged and maybe a friend’s wedding to attend. In the case of Leeds United, they are for once a bit more advanced than everyone else, and are usually a couple of months into a vague and wishful programme of “re-building for next season” by now, having long since given up on the current one. 2016 is no different, and we once again count down the games until we can pack this season up into a suitcase and send it off on a one-way ticket to ‘destination unknown’. But that’s not to say there isn’t plenty of fun to be had in the meantime, it’s just that none of that directly involves football. The inherent ability of Leeds United’s fans to create their own entertainment is legendary, and has become ever more important in the last few seasons with such a dearth of merriment to be derived from events on the pitch. Whether this is in the stands, under the stands or in the pub before or after the game, Leeds fans are perhaps at their best when the team is at its worst; when the gallows humour and proud defiance comes to the fore, and God knows we’ve had some practice. Of course we know all about this at the Old Peacock. Despite another season of chaos, legal cases, sterile football and everyone largely running to stand still, the pub has been packed out before and after every home game with a boisterous atmosphere and vibrant energy that you suspect could power a small fishing village in France for a week. But for once the fun needn’t end with Leeds’s last home game of the season on April 30 versus Charlton, because that other vehicle for abject mediocrity and routine anti-climax, the England national team, will soon be rolling into action. Yes it’s once again the time for football fans to forget the daily grind of following their club team and support the national side, without the expense, mental anguish and endless hours stuck in train stations in the middle of nowhere. For non or part-time-football fans it is the time to feign interest for a fortnight via car flags, jester hats and St George’s flag face paint, as the country is whipped up into a frenzy of patriotism like we’re going into war. At the Old Peacock we will certainly be doing our bit, and all of England’s games in the Euros 2016 in France will be beamed live on our big screens, with drinks and food offers to keep you fed and watered as the action unfolds. Our Euros events will start with all of England’s warm-up games against Turkey (May 22) at the Etihad Stadium, Australia (May 27) at Sunderland’s Stadium of Light and Portugal (June 2) at Wembley. Then the real action starts, and you may wish to make note of these dates and book some time off work or the family chores, if you haven’t already. England start in the Euros on Saturday June 11 against Russia, then play Wales at 2.00pm on Thursday June 16, on a day when national productivity will be at its lowest and highly-creative absenteeism at its highest. England’s final group game is against Slovakia on Monday June 20, and after that I suspect we are tempting fate by trying to work out when or where England are likely to play should they advance from the group stages. Suffice to say, at the Old Peacock we will be behind England all the way, and with a more-than-passing interest in the other home nations, and whenever they are playing we will be welcoming you all like an Elland Road match day, and we hope that there is an atmosphere to match. Naturally, we will be showing every game live throughout the tournament, and that includes the exploits of Northern Ireland, Wales and the Republic of Ireland. In the midst of England’s friendlies in the build-up to the Euros we have a Family Fun Day on Sunday May 29, which is a Bank Holiday weekend. There will be plenty of family activities throughout the day, with games for kids and an adult tug-of-war, along with food and drink offers to keep everybody happy. Precise details will be on our Twitter and Facebook pages and posted in the pub nearer the time, but for now pencil the date in. Until then there are another three home games left for you to enjoy/endure, whilst partaking of your pre-match ritual at the Old Peacock. Leeds entertain Reading on Saturday April 16 and then three days later welcome Wolverhampton Wanderers on Tuesday April 19. These double-header home games usually attract an impressive overseas following, so we are bracing ourselves for the usual influx of the Scandinavian and Irish contingents setting up camp in the pub for a few days. As mentioned above, Elland Road hosts its final home game on April 30 when Charlton Athletic come to town; another club with disgruntled fans and ownership wrangles. At least we can be thankful that Leeds are not staring down the barrel of relegation back to League One, as Charlton are, but certainly we can have some sympathy with their plight. The final topic to bring to your attention this month is our Wednesday Curry Night, which is bubbling away nicely and becoming as popular as our Thursday Steak Night and traditional Sunday Lunch. We have a choice of three curries each week, usually a hot, medium and mild variation, and a mixture of lamb, chicken and beef. Vegetarian options are available too. 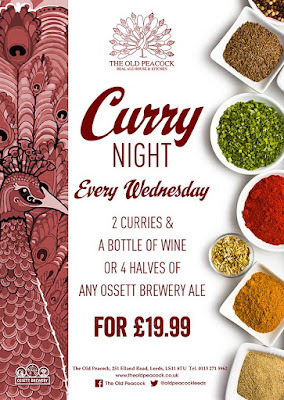 Many of our customers so far have commented on the outstanding value, whereby for £19.99 you get a pickle tray and poppadums to share, two curries with naan breads, and a bowl of rice to share, PLUS a bottle of house wine or four halves of Ossett Brewery ales. If the fresh-cooked aromatic curries aren’t to your taste, however, our normal menu is always available, so you have no excuse not to check out what everyone is talking about. So we will see you in April for the last three home games, plenty of times in between for our great themed food events, and several more times over the summer, when the football never stops! In the meantime, check out our Facebook and Twitter pages for all the latest updates on events, menus and match days and we look forward to seeing you all soon.